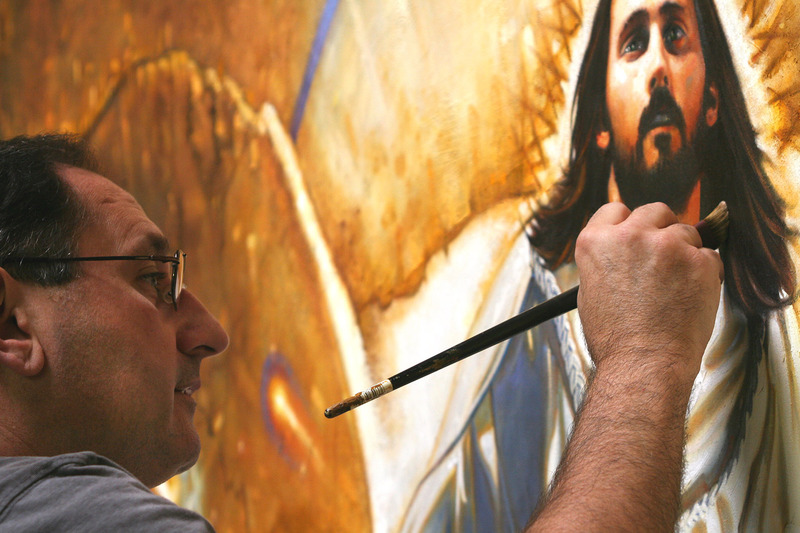 The single largest contemporary depictions of Christ’s Resurrection anywhere in the world. 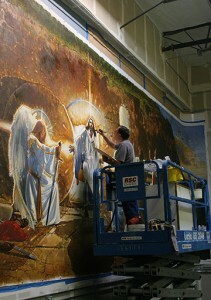 After years in the making, we are proud to unveil Ron DiCianni’s largest masterwork, The Resurrection Mural. 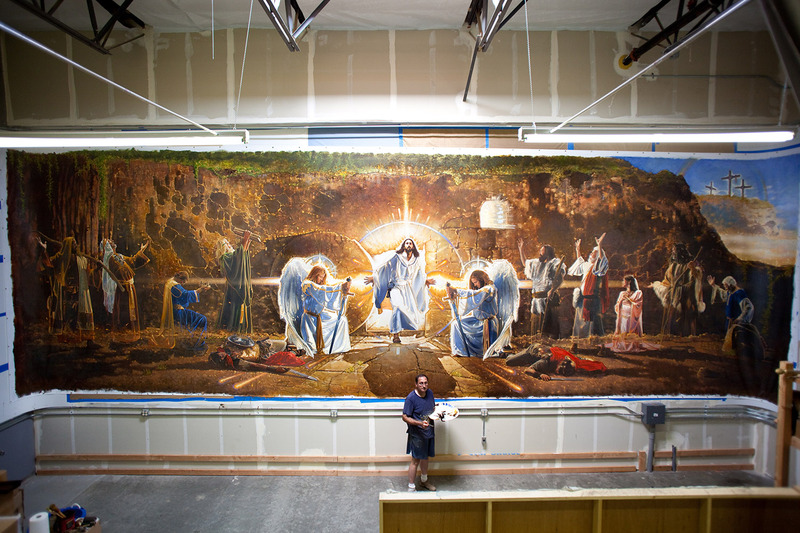 This incredible piece, commissioned for the newly opened Museum of Biblical Arts in Dallas, displays the Resurrection of Christ in a brand new format. Standing 40 feet wide by 12 feet high, this breathtaking mural allows the viewer to look into Christ’s eyes and see first hand that he alone has conquered the grave. To see a larger image, please visit the Resurrection Mural page in our store. This mural was commissioned by the Museum of Biblical Art in Dallas, TX., after experiencing a tragic fire which culminated in nearly a total loss to the museum’s contents, among which was a mural that was well known for them as a “pilgrimage piece” one that many came from all over the world to see. After deciding to rebuild, the museum entered in negotiations with me to execute a new mural on the topic of The Resurrection of Christ. Once a contract was signed, I prayed for direction, and sketched out two ideas based on the idea. After selecting their preference, which also was mine, I began working on the final mural. Because of the mural’s large size, I needed to relocate my studio to a warehouse large enough to accommodate a one-piece custom made canvas 12’ x 40’. I also needed to invest in a mechanical scissor lift which would allow me to elevate myself high enough to paint all across the canvas. My process in preparing for all of my paintings consists of the search & selecting of models, custom made costumes, professionally sculpted props, such as the tomb made by Warner Bros. for me, and investing in premier paints and materials that would exceed all museum standards. My paints are Old Holland, made by the same factory in Holland that made paints for many of the legendary painters such as Johann Vermeer, & many others, centuries ago. Once all this was in place I assembled the entire group of models and props at a professional photographers studio for a massive photo shoot which resulted in over a thousand photographs for me to refer to as I painted. I was fortunate to have had the support of many fine world renowned painters to pose for me, such as Morgan Weistling, (David) Thomas Blackshear, (Abraham), Chris Hopkins (John the Baptist) & Michael Dudash (Isaiah). It seems that over the centuries every artist longed to paint a definitive scene that would stand the test of time. For Michaelangelo, it was the “Creation of Adam” which he did for the Sistine Chapel. For Rembrandt, it was the scene of “The Prodigal Son.” For me, it is “The Resurrection”, as this one act of history separates Christianity from every other religion, philosophy and dogma. It authenticates The Nativity, The Crucifixion of Christ, and legitimizes every word Jesus said concerning Himself and His relationship to God. Many may ignore the Resurrection at their peril, but none can deny it as it is historically proven beyond doubt. My hope is that as this mural is installed, many will be confronted with the scene of “The Resurrection” and make the decision that He is worthy of being called their Lord and Savior. Taking my cue from Hebrews 12:1, I thought a great scene would be Christ emerging from the tomb, with many heroes of the faith waiting for Him. The result was capturing just that moment of Christ emerging from the tomb. In 2009, this mural came close to being consumed by fire as well when a wildfire burned to within just a few hundred feet of the warehouse complex I was painting in. We had to evacuate with smoke and ash falling all around us. The next few days were tense with waiting, but by God’s grace, when I was finally allowed back in to paint, not even the smell of smoke remained on the canvas. Let me draw your attention to some elements in the mural that you may miss at first glance. Notice the rock beginning to crack under Christ’s feet due to the earthquake. Notice the “keys of death & hell” (Rev. 1:18) tied on Christ’s belt. Of all the figures, the three kneeling are David, Esther & Daniel… royalty bowing to the greatest of all Kings! In the right top background is Mt. Calvary, also known as “the place of the skull”. You can see the hint of a rainbow above as the same promise God gave after the flood. It still stands the test of time. There’s even more elements that can be seen in the full size mural (and in the reproduction!) so I invite you to make a point to see it at the museum and bring a copy into your home today. Of course I’d be remiss if I did not point out the part of the mural that matters most… Christ emerging from the tomb, victorious and alive! I invite you to rejoice with me this Easter, not merely in the completion of this mural but in the Cross…the Empty Tomb… the One who conquered both, our Savior Jesus Christ! 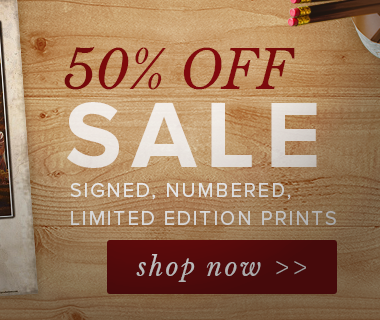 Find out about how to bring this masterwork into your home, office or church in our store.